This is the fourth post in our new Head to Head series where we compare and contrast a variety of topics! Don’t miss eLearning Versus mLearning, Microsoft Word vs Google Docs vs LibreOffice, State vs Private Colleges, and be sure to check back for the next post! In nature, competition is everywhere. Organisms must compete to pass along their genes and succeed at “survival of the fittest.” Many industries and work environments mimic the animal kingdom; employees fight for promotions, awards, recognition, and they may even stomp on fellow employees’ feet in order to succeed. However, we also see another phenomenon in nature—cooperation. This practice allowed early humans to work together, overcome predators, and create inventions that has propelled us to the top of the food chain. Likewise, businesses have benefited from this mindset as well. Many startups emphasize a collaborative environment. Whether we like it or not, social networking and other forms of instant communication are making it easier and easier to collaborate. We can share ideas at the click of a button and provide feedback almost instantaneously. Most industries seek to provide the best possible products for their customers. Collaboration between team members promotes an environment where employees can create the higher quality products or services. Rather than one employee taking the bulk of the work, everyone can put his or her ideas on the table and select the best ideas that will achieve the best results. Often, it doesn’t matter who is right; it matters what is right. This means it matters what will excite and help customers and lead to the best profit. When employees have access to one another’s ideas, projects move faster. After all, 100 workers can build a much larger structure in less time than just one worker. Innovation drives the desire to move forward and build on projects that others have started. Furthermore, the number of collaboration tools are growing rapidly. Google Docs is no longer the only tool on the block; now sites like Doodle, WhatsApp, Popplet, Box, and more are expanding the collaboration marketplace. Is There Still Room for Competition? If everyone is working on a project, who owns it? Should there even be ownership? These are tough questions that arise due to competition issues. A competitive environment leaves us constantly looking over our shoulder, hoping that we are better than the next person who comes along. Competition certainly is a driving factor for producing more and better products or services. Though competition and collaboration are two very different approaches to the same outcome, how do we optimize these practices in a business environment? The secret seems to lie in the idea of “internal collaboration, external competition.” Within the company, team members collaborate and the best collaborators become the top-performing employees. Meanwhile, these teams remain competitive in the industry. The competition is driven by collaboration. OpenSesame offers courses on how to turn competition into collaboration. 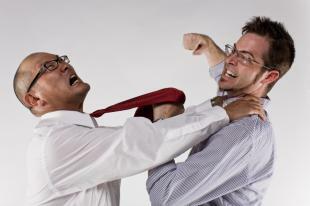 For instance, Managing Conflict by Syntrio shows how you can mediate a collaborative solution in a workplace conflict. Likewise, Everybody Wins by Sollah shows how you can actually transform a conflict into a collaborative experience. Finally, Turn Conflict into Collaboration, a course by Franklin Covey, outlines this habit of highly effective people. Neither total collaboration nor total competition seems to work. Instead, successful businesses, teams, and individuals balance both collaboration and competition and utilize each skill when necessary.